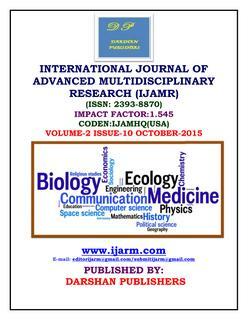 International Journal of Advanced Multidisciplinary Research (IJAMR) by www.ijarm.com (www.ijarm.com) is licensed under a Creative Commons Attribution-NonCommercial-NoDerivs 3.0 Unported License. © 2013-2014 IJAMR. All rights reserved. Website by cgs infotech,Rasipuram,Namakkal Dist,Tamilnadu,India.